Located along quiet tree-lined Sullivan Street, 30 Sullivan is a mansion with the extraordinary width of 25 feet and five levels of beautifully appointed interiors plus a stunning rooftop terrace and an expansive backyard. In total, the home offers 6,547 square feet with 1,434 exterior square feet. Unique features include gated private entrance, 11-ft ceilings, 8-ft windows, Lutron lighting, Savant smart home automation system, private elevator, dumbwaiter, and radiant floor heating. In addition to the private terrace off the master suite, this newly built mansion boasts a spacious, sunlit backyard and a rooftop terrace with a full outdoor kitchen. Parlor Floor: As you enter the gracious entry foyer, you will find the parlor/sitting room, powder room followed by the sun-blasted Poliform eat-in kitchen. 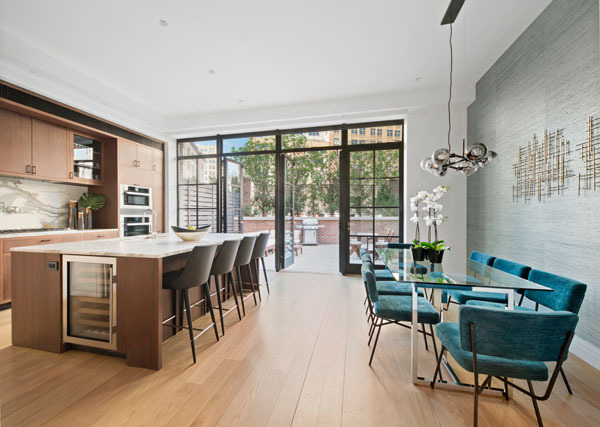 This chef’s paradise includes Sub-Zero, Miele and Viking appliances and is appointed with walnut cabinetry, Lagano marble counter tops, in-set video and a dumbwaiter. The kitchen opens to the beautiful backyard garden that spans over 630 square feet and includes a gas grill and verdant lush landscaping. Entertaining Floor: The grand scale living room and formal dining room each have gas fireplaces and are perfect for hosting large groups or intimate family gatherings. A powder room adds convenience. Brilliant natural light streams in over the tree-tops of Sullivan Street. Third Floor: Three very generously sized bedrooms and 2 full bathrooms, all are filled with natural light, occupy this floor. Closet space is plentiful. Fourth Floor: The master suite comprises the entire floor and includes a gas fireplace, massive closets, and sumptuous master bath with double vanities, freestanding soaking tub, separate stall steam shower, and private water closet. An 180 square foot private terrace with gorgeous western views is accessed via the bedroom and the bathroom. Roof Top: Elevator access leads to the roof, which features 180 degree views of the city, a complete outdoor kitchen, outdoor fireplace, and powder room. Lower level: The lower level is equipped with a maid’s room, gym, media room, wine storage, full bathroom, and laundry room that can be further customized to suit your particular needs or interests.